KEEPER OF THE SNAILS: Reading. 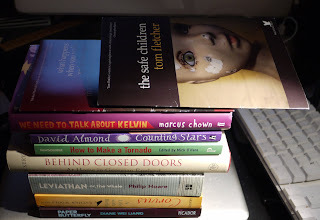 Here they are: my recent acquisitions. And I still haven't read the recent acquisitions or the ones before that and the guilt is piling up in thick ugly layers, and I think that maybe what I need to do after I have gone to China is just go away somewhere and not do anything else but read and read and read and sometimes I think I am not going to live long enough to read all my books, in fact I think it is a good bet that I shan't live long enough to read all my books because I am sure they are going to come into this house faster than I can read them and yet I still love them, and rip the small brown jiffy bags open with the same Christmas zeal I've always had, and get that strange thrill of anticipation at seeing all that print, all those pictures, all those words and the promise of yet more worlds that no one else will know because a book is a fusion between the world written and the world read - an imperfect overlap producing something new again. And tonight then, I read. 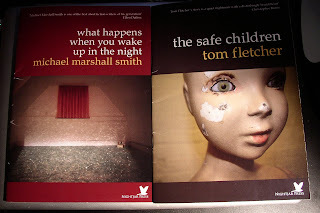 Two short chap books I've bought from Nicholas Royle's Nightjar Press: What Happens when you Wake Up in the Middle of the Night by Michael Marshall Smith and The Safe Children by Tom Fletcher - both such wonderfully strange stories and disturbing visions of adjacent worlds that could be but luckily aren't. - "Christmas zeal," lovely turn of phrase, will steal. Also feel that way about a new book: slurp in the cover, enjoy the feel of the edges, and most of all, the smell of the paper and ink before diving into the delights inside. All this so horribly lacking in e-readers. I know, I know, just look how long it took me to read your book. I have a to-read shelf there're so many now and I simply can't seem to break the back of it. I mean it's nice to get sent books to review - who turns up their nose at a free book? - but I'm just not that quick a reader. I suppose there are worse things to moan about. I feel your pain, Clare. I, too, have a stack. And then there's the library ... If there was a second one of me, she'd be doing nothing but reading. Heh, yes, Nora, I guess China is 'away' - not sure I'm actually going to have that much time to read (unless I get quarantined...) and I agree with you about all those sensory delights. Yup, plus ca change, eh Jim! Oh how I'd love to be able to construct a sentence as long and as readable as that. Better than a jog around the park! Thank you Roy! How very kind you are. I know what you mean Clare, I keep setting myself the task of getting my pile down a bit BEFORE I add anything to it, but I never do. I always make that vow and the next day spot a book I need NOW! By the way - I'm starting on 'Earth' from the Ox-Tales set on your recommendation. I still haven't read any more of those, Jem - but the ones I did read were excellent. I hope you enjoy them!